In at the Digital GM level myself. I can teach you some Savage Worlds if you want. I wrote the original commercial ruleset for Fantasy Grounds so have a certain fondness for it. Ill be in for the Just the books GM + the Physical map. Amazing how these broken systems seem to work for thousands of people for decades. People use the term "broken" pretty casually. I think the big issue with Rifts and Palladium in general is how poorly edited and organized the games are. Once you figure it out and get past character creation, it works pretty well. Of course, I still run Palladium pretty often. Not all the time, but I've run Fantasy, Heroes Unlimited, and Rifts all in the bast five years or so. I still get confused on some of the rules, and character creation is a damn chore. I don't mind long character creation, but spending an hour writing down skill names and figuring out the percentages is no ones idea of fun. Plus there's different levels of "working" especially in regard to the amount of effort people have to go to make it work. Palladium's decline from its early 90's boom into a niche product is due in large part to the unwieldiness of its system, especially when compared to competing options like d20, the OSR revival systems or the many, many other simpler options that are out there. Scuttlebutt and rumor have it that Kevin insisted on doing layout himself and did it with a light table to the bitter end, despite digital methods being available, so every change after the initial layout run meant either redoing all the layout from that page on or wedging it in wherever it would fit. 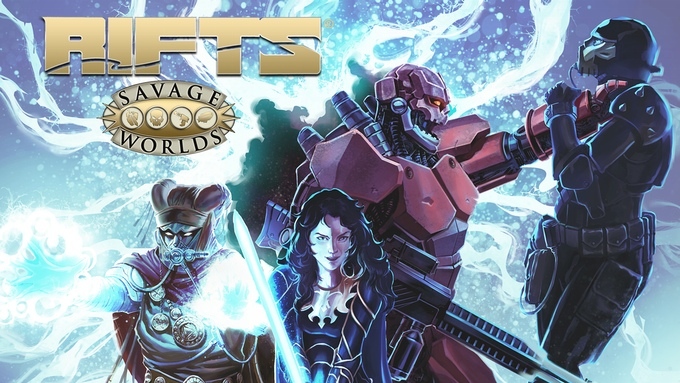 I was considering backing this KS, but I've never loved Rifts so much in my early days. The real question is will Seventh Sea hold the records for RPGs or will Savage Rifts break them. Everything is written already and delivery is a month after kickstarter ends. Going to wait till 48 hours and then take the plunge. 15.00 for shipping of three digest sized softcover books and a screen? Guess that means pdf for me. Would you be interested in promoting this relevant kickstarter?